A recently proposed mean-field mesoscopic theory of mammalian cortex dynamics describes the salient features of rhytmic electrical activity in the cerebral macrocolumn, with the use of inhibitory and excitatory neuronal populations . This model is capable of producing a range of important human EEG (electroencephalogram) features such as the alpha rhythm, the 40 Hz activity thought to be associated with conscious awareness  and the changes in EEG spectral power associated with general anesthetic effect (e.g. the so-called "biphasic" response) . From the point of view of nonlinear dynamics, the model entails a vast parameter space within which multistability, pseudoperiodic regimes, different routes to chaos, fat fractals and resonances occur for a range of physiologically relevant parameter values, giving rise to a multitude of rich and elaborate bifurcation scenarios. Examples of these are the Shilnikov saddle-node bifurcation (see Figure 1 and ), the homoclinic doubling cascade and different kinds of resonances. The origin and the character of these complex behaviors and their relevance for EEG activity are illustrated. The largest Lyapunov exponent in color reproduced from , with superimposed two-parameter continuation of saddle-node and period-doubling bifurcations for periodic orbits of a mesoscopic mean field EEG model. 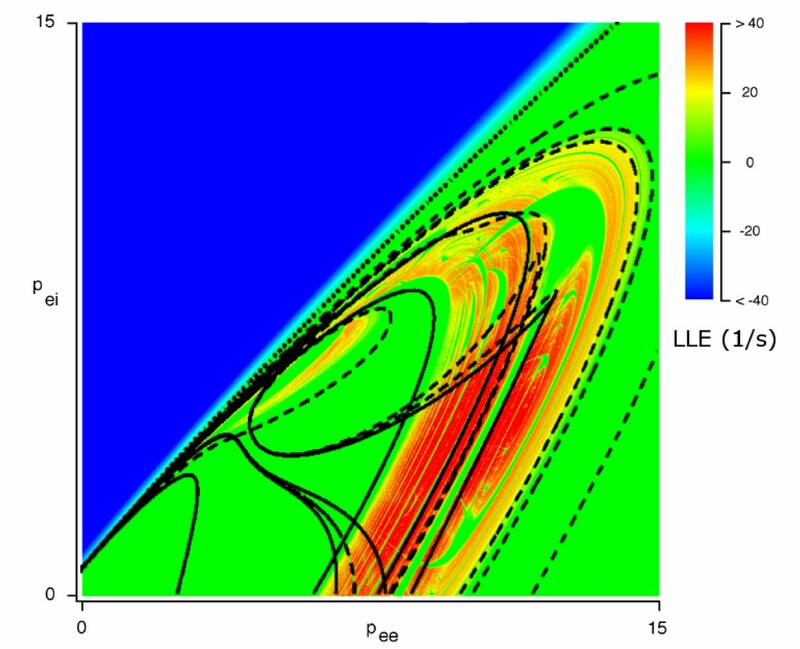 The leftmost wedge of chaos terminates for negative values of the exterior forcings p ee and p ei .